Our skin and hair are exposed to so many chemicals these days, that to further use chemicals to beautify the way our hair look, or cover naturally grey hair seems to be a little harsh. 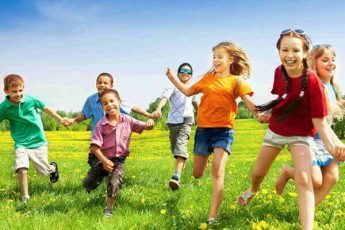 Moreover, there are people who have sensitive skin and scalp that reacts to harsh chemicals in hair dyes and hair colours, while some others are on a look out for vegan hair colours, or hair dyes that are made from plant extracts. If you are one of them and are looking for hair colours and hair dyes that are gentle to your hair, don’t contain chemicals and have natural ingredients, then you are at the right place. Here we have listed the top 10 natural hair dyes available in India with organic ingredients and 100% ammonia free suitable for all those with sensitive scalp and allergies to chemicals. Winner of the best natural hair dye by Cosmopolitian in 2016, Natulique is a professional hair colour brand that uses certified organic ingredients that provide a more gentle hair colour and extra conditioning. Their unique formula includes pure natural sunflower seed extract, jojoba oil and apricot seed oil, which lends a fabulous, natural look to the hair, with minimal harm done. It is gentle to your hair and comes in a range of 73 fabulous shades. A henna based hair colour that uses natural indigo to create different shades, Light Mountain is true to the term organic hair dye. 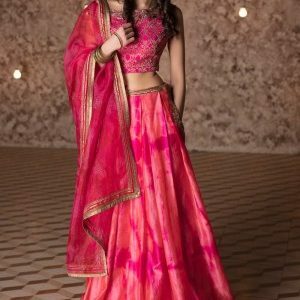 What sets it apart from the usual henna hair dye brands available in the market is the shade card they offer in spite of being completely natural. They use only 3 ingredients in their hair colour – 100% certified organically grown lawsonia inermis (henna), indigofera tinctoria (indigo) and cassia auriculata (senna) leaf powders. The three ingredients are used in different combinations to achieve various colour variants making them one of the top hair dyes for women to create a fashionable statement. 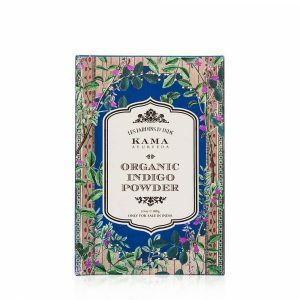 Kama Ayurveda is synonymous with high quality beauty and hair products and their organic henna hair dye that lends your locks a lustrous, healthy colour, is no different. Kama Ayurveda’s Henna Powder is 100 % natural, certified by Lacon India and not just dyes hair, but also conditions them to lend them a healthy glow. It has cooling properties and adds strength to hair. Probably the only manufacturers of organic hair colour in India, with their own pharmaceutical-grade clean room facility, Cultivator has over 3,000 acres of cultivation land and 1,00,000 sq feet of processing facilities in Jodhpur, Rajasthan. The company originally founded in 1999, changed its name to Cultivator Natural Products in 2005. They specialize in manufacturing organic hair colour for women and men that is certified by over 19 certification bodies. Their key ingredients include Cassia, Indigo, Henna, Aloe, Chamomile, Amla, Ziziphus, Eucalyptus and Turmeric. Logona is a herbal hair colour with all their hair colour products formulated with ingredients that are of natural origin and practicable even for those under 16 years of age. A company with a history of creating herbal products for over 40 years, Logona Hair colours are natural and use plant extracts from controlled organic cultivation. They have an extraction facility in at Kräuterwiese” in Germany and a specialised extraction process to ensure quality standards are met. The natural LOGONA herbal hair colours come in 17 individual shades as a powder for mixing or as a ready-to-use cream, suitable for use by men and women both. It can be used to create hair colour highlights as well as complete coverage. The hair colours are gentle to your hair and contain only natural colorants such as organic henna, ground walnut shells, or indigo leaf and contain no artificial colorants are used. The hair dyes mix with your natural hair colour and lend a lovely natural look. The hair dyes also contain avocado oil and plant proteins that nurture the hair during the dyeing process, shikakai fruit that strengthens the hair and supports in the absorption of the dye and other such natural ingredients. 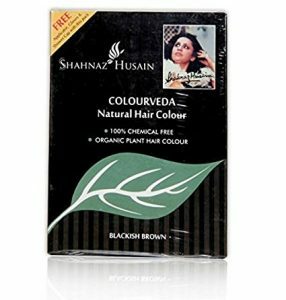 Colourveda by Shahnaz Husain is an Ayurvedic natural hair colour, containing traditional plant ingredients that impart natural colour to the hair. 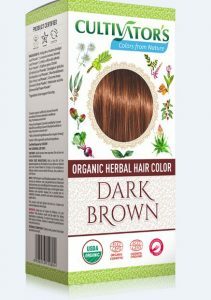 Containing natural colourants like henna, indigo and catechu, it not just dyes hair, but also protects the hair from damage, keeping it strong and healthy. The ingredients listed on their website include: Indigofera tinctoria, Lawsonia alba, Centella asiatica, Emblica officinalis, Eclipta alba, Acacia Concinna, Rubia Cordifolia, Melia, azadirachta, Acacia Catechu. 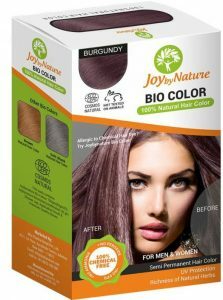 Joy by Nature hair colour is an organic hair colour that does not contain chemicals such as ammonia that damage your hair. Instead, it is mild on the hair and has a nourishing effect. It also does not make the hair and scalp dry. Unlike chemical hair colouring agents, Joybynature Organic does not colour the hair immediately, it takes about two days for the hair colour to seep in and colour your hair. It brings out a natural hair shade that suits those with partial grey hair, white hair and others who simply want to try a different shade to colour their natural hair. Joybynature Organic natural hair colour is prepared from Ayurveda certified ingredients such as Henna, indigo, Brahami, Catechu, coffee, Bhangra, Madder, Amla, Reetha, Shikakai, Aloe vera, Manjishtha and Woad. 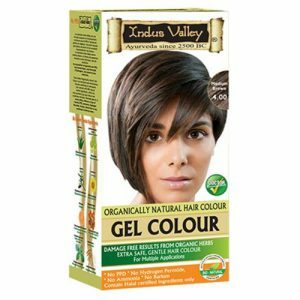 Indus Valley organically natural gel colour uses the revolutionary PHAB free technology (i.e. free from PPD, Ammonia, Hydrogen Peroxide and Barium) and provides hair colouring in just one application. Its gel colour contains aloe vera, jojoba and wheat germ oil which moisturizes and provides shine and volume to hair. 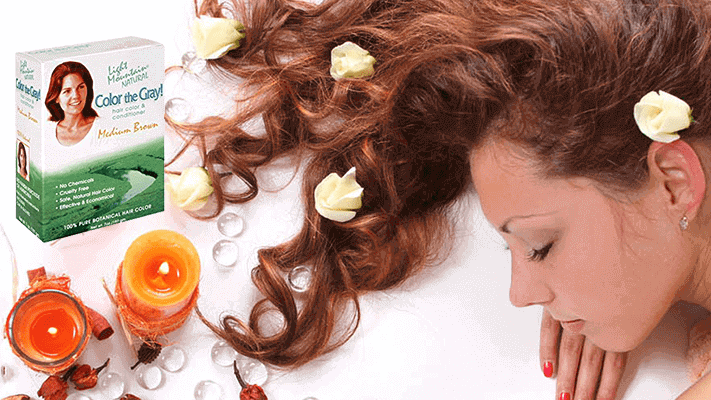 It also contains basil, henna and sunflower oil that prevents dandruff and enhances the natural colour of hair. Its blend of amla, honey and orange provide necessary nourishment, prevent hair loss and encourage hair regrowth. Available in 12 different shades including black, caramel, burgundy and more, this natural hair dye is suitable for use by both men and women. 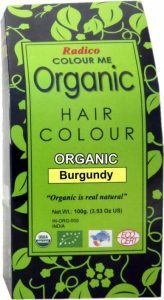 Colour Me Organic Hair Color is a Professional hair colour manufactured by using Ayurvedic Certified Organic herbs – henna, methi, amla, hibiscus, bhringraj, coffee, indigo in different proportions. 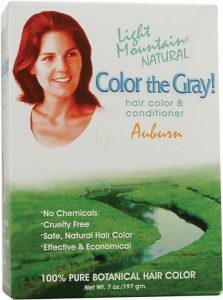 Its an organic hair colour that not just covers greys effectively but also blends in the colour smoothly without the use of any synthetic ingredients. It lends a vibrant, stable colour and is gentle on your hair and nourishes it to prevent breakage and over drying. If you are allergic to chemicals and have a sensitive skin, this chemical free hair colour is exactly what you need. It is certified from ECOCERT and is completely safe for all hair types. A unique and gentle formula that contains no ammonia or parabens, Herbatint hair colour is a permanent hair dye that contains 8 organic herbal extracts that provide 100% grey hair coverage while making the hair look healthier and naturally beautiful. It can be used to create colour highlights or full complete application. Dermatologically tested on sensitive skin, its skin compatibility is excellent. This result confirms the brand’s distinctive quality and its unique finely balanced formula. The developer contains a low hydrogen peroxide concentration (less than 3% after mixing, equivalent to 10 volumes), well below the 6% limit permitted by the European legislation (EC NO 1223/2009). Besides, Herbatint uses gluten-free and Nickel tested ingredients. Packaging is made of totally recyclable uncoated paper with designation of origin. Allows you to lighten your natural colour up by a maximum of 2 tones.